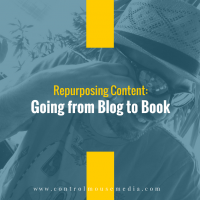 Repurposing content is key to running a good content strategy. In fact, you might say that it’s not really content strategy if you’re not repurposing at least some of your content. That’s why I’ve been spending the past few episodes on the topic – helping you make multiple uses of your content, and planning for it up front so that you are efficient all the way through the process. I have two key methods: Upstream and Downstream. In this episode, I’ll lay out my upstream method, and in next week’s episode, I’ll focus on my downstream method. With the upstream method, you can achieve two goals at the same time. The best example of this is my blog-to-book process, which I cover in detail in this episode. You just need a plan to get started. I’ve used this method with clients, and today I’d like to share that method with you. Listen to the episode here or subscribe in iTunes. I use this blog-to-book method with my clients. In the episode, I referenced Dr. Devorah Heitner, who teaches digital citizenships to schools, administrators, and parent groups. Using my method, I helped her produce her latest book, Screenwise: Helping Kids Thrive (and Survive) in Their Digital World (affiliate link), which was picked up by Routledge and published in September 2016. Lastly, here’s the link to CreateBiz, my 42-module online course for writers, musicians, and visual artists. Subscribe here (and select podcast / every new post) if you’d like to be notified as soon as the next episode is published! Published March 27, 2017 by Michael Boezi.